As the anniversary of Mert’s passing nears, I realize that the lessons she taught us is the legacy she left with us. Reading through them again, I realized there are some I still have not been doing, i.e. time for play, trips, time with siblings. I think it is time for another girl’s night with my sisters! 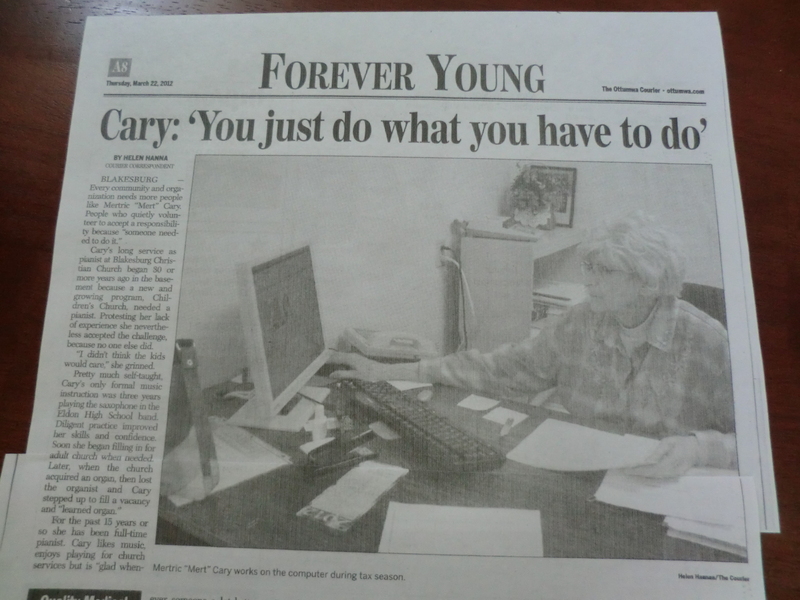 My aunt Mert was featured in a “Forever Young” article in the Ottumwa Courier, a local paper. The article, written by Helen Hanna, covered many amazing things about her. Accept responsibility because someone needs to do it. Plan on serving for a long time. Invest in kids; be a teacher. Don’t let your lack of experience keep you from accepting a challenge. No formal training? Practice diligently and your skills and confidence will improve. Fill in when you are needed. Find a job doing work you enjoy. Stay involved in your children and grandchildren’s activities. In your chosen career, be willing to teach others. Play: sports, games, cards, etc. Make your home welcoming to children. Have hobbies: watching sports, crocheting, and reading. Cancer, or other illness, does not have to stop you. Don’t let physical changes (like losing her hair 6 times) bother you. Depend on your siblings and let them depend on you. Keep your faith strong and your sense of humor intact. The title of the article summed it all up.